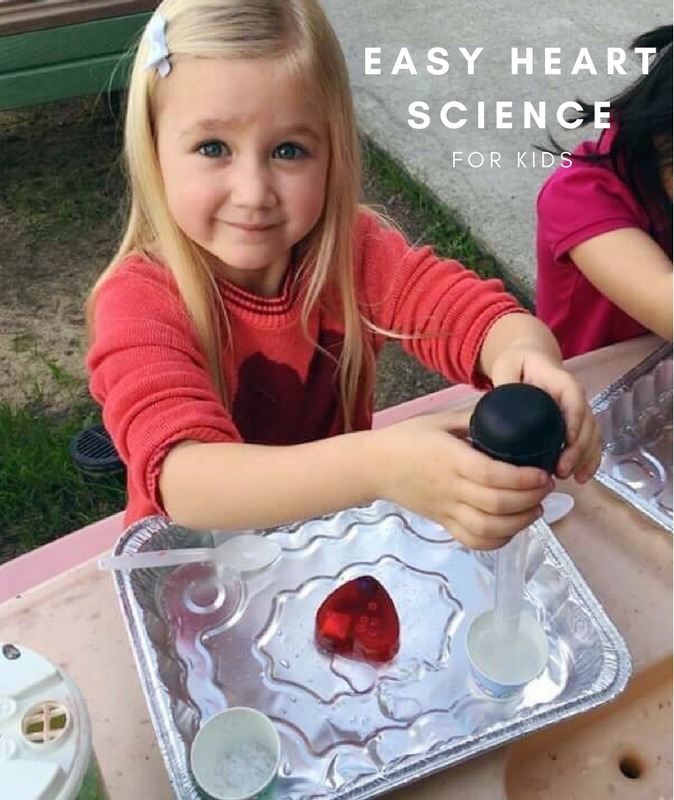 Each year we do frozen heart science with my kids and their classes at school or groups of their friends! It is one of our favorite activities! 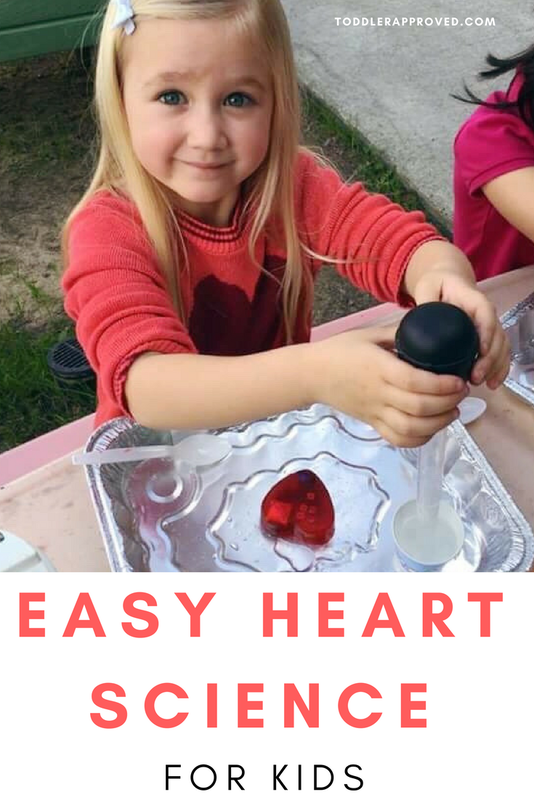 We also love doing heart hopscotch and spin art heart suncatchers! I get asked a lot about how to do this activity with a larger group of kids and what our set up looks like, so today I'm going to share a little about the supplies we use and how we set it up so that kids can have a great time! We love to do ice excavations for pretty much every holiday and just change up the materials and shape of our ice! Frozen heart excavations are so simple and kids always get a kick out of them! 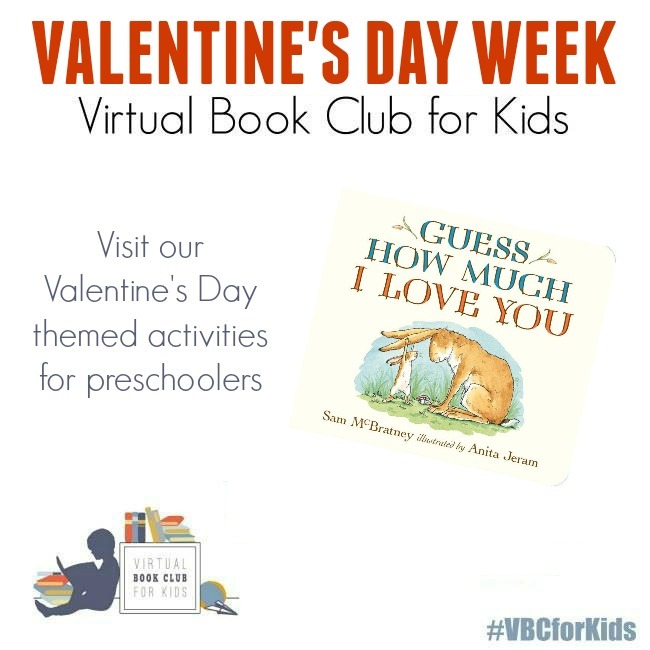 Today we are sharing this activity as part of our Valentine's Day Week for our Weekly Virtual Book Club for Kids. 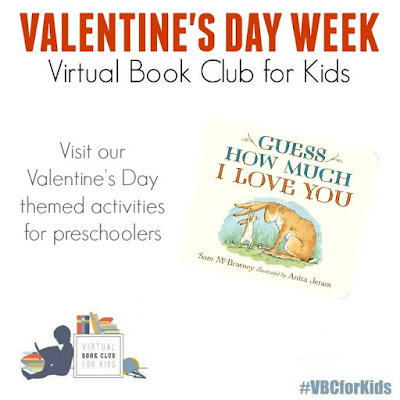 Our featured book for this week is Guess How Much I Love You by Sam McBratney! Tomorrow we'll share a few additional favorite Valentine's Day themed books for kids. Start by filling up each mold with a little water and add an some beads, sequins, and gems. Only fill the mold half way and then put it in the freezer. Let it freeze for a few hours and then add another few beads and then fill it the rest of the way. If you only put the beads in at the beginning, the beads and other embellishments will all settle to the bottom of the heart and not be spread throughout. Once the hearts are completely frozen, you are ready to start excavating! The goal is to get all the gems and jewels and beads out of the heart! To set up this activity, I usually do it with half of a class at a time. Maximum around 8 kids (preschoolers) or 4 older toddlers. I have also done this with kindergarten classes of groups of 12 at a time. At each child's spot I put an aluminum pan, a turkey baster, a cup of ice cream salt with a spoon, and a cup of room temperature water. Next to their pan I put a sandwich ziploc bag for them to use to collect their treasures. Once we are ready to go and I've explained the directions, I give each child a frozen heart. The directions I give include how to use the materials: use the spoon to scoop the salt bc you don't want to burn your hands, don't touch the heart, use the turkey baster to scoop up the water, and put your turkey baster in your pan if you aren't using it... don't rest it in your cup or the cup will fall over and water will spill everywhere. Someone does this once every time but after that one time, no one else usually does it! In the pitchers I put warm/almost hot water. When the kids run out of room temperature water, I offer them warm water. It is helpful to have two adults running this activity so that kids can get help and more supplies when they need it. Once we've explained all of the instructions, I let the kids start squeezing water on their frozen heart and scooping salt. I will also sometimes give them forks so they can try and dig out the gems that way too. They often will brainstorm additional tools they need... so I try and give them access to them too (assuming they are safe). After awhile, the kids start realizing that warmer water melts the ice faster! I love watching as they discover this. They also realize that the salt makes the ice melt faster and they love adding more and more of that! Make sure to remind kids NOT to touch the ice, since the salt makes the ice colder (it lowers it's freezing point) and can hurt them if they touch it! Once their heart is completely melted, they can use their spoons to find all of their gems and other trinkets and stick them in their ziploc bag to take home. It always is so cute to see how excited kids get about their treasures that they find in the ice! Have you ever done any ice excavations? Have you ever tried this activity with a large group?